Alright guys, I need help. I have trolled and searched the forum for days with no luck. 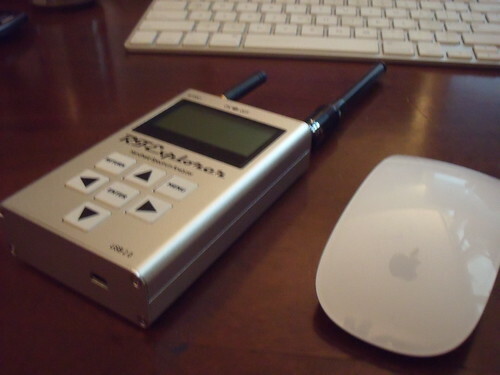 But I saw mention of a handheld RF spectrum analyzer that is most likely cheap POS, but was only a couple hundred bucks. One of the guys said he bought it on a gamble and through it in his work box and was amazed how many times it saved the day. Was wondering if anyone knew what product is or where I could get one. Sounds like a pretty safe gamble compared to the several $1,000.00+ alternative. Thoughts? There are two out there that qualify as budget level products. The better one is the TTi PSA series, the 2700MHz version will run you about $1,950 or so. I use one for my house job, and it is a capable unit. 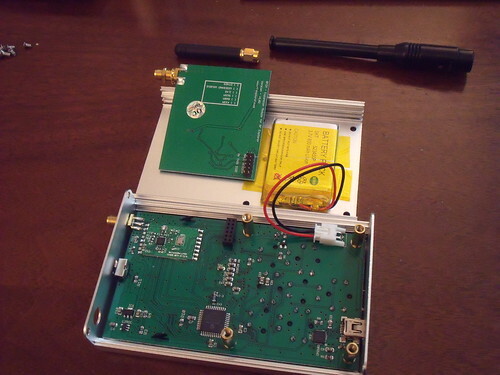 The other, which is a bargain basement unit, and which has recently come onto the scene is the RF Explorer WSub1G which will work from 240MHz to 960MHz, and costs about $130 at SeedStudio. They are currently sold out, though (actually they sold like 40 units in a day or two when they came back in stock earlier in the week). There is an expansion card available that will let you analyze 2350MHz to 2550MHz (the Wifi range) for around $50 or $55. 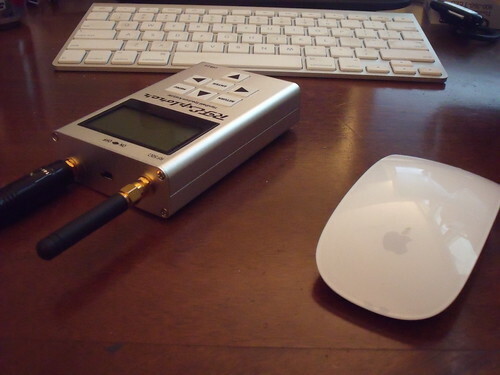 No one that I know of has yet used one for live sound applications, but a couple have ordered them and we are awaiting field reports. 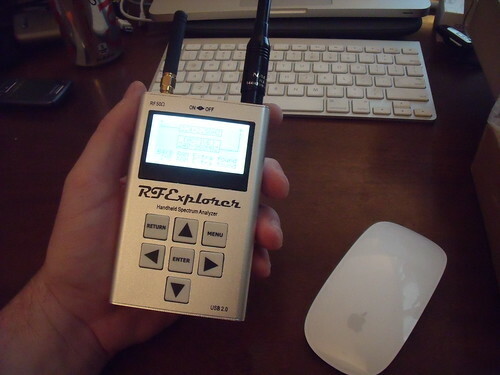 The RF Explorer was originally built to look at the ISM bands, and used by and sold to people running remote controlled airplanes with remote video links. There is a wide band version called the WSub3G which is due out in April and will analyze 15MHz to 2700Mhz, no official word on price, but my sources say somewhere in the $250 range. edit: looks like there are some of the WSub1G units already assembled with the 2.4GHz card available for $174. Justice, you're my hero. Maybe I'll be able to put in on the field report. wait for that one (is it supposed to be out soon?). Again, than you and please keep those reviews coming, and some pictures please! But unfortunately it's only narrow band for WIFI freqs. at this time. Okay, i've got it 'in hand' so i thought i'd share some impressions. i have to say it arrived more quickly than i anticipated considering it got it direct from hong kong. i think total wait time was maybe 10 days. And shipping was free, so yay to that. Packing was perfectly adequate. 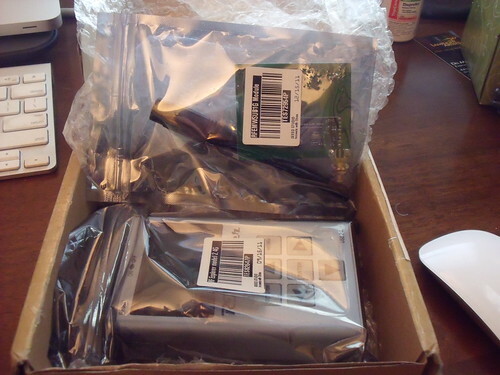 i particularly liked the zip lock antistatic bags. Never saw those before. 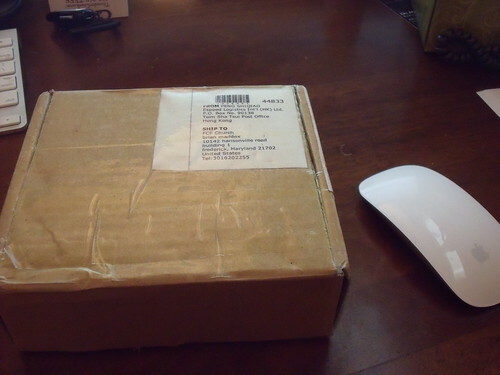 Since i ordered the 24GgHz version with an add on SUB1G card, this is how it came. Installing the card was pretty simple. and they have online instructions available, but i of course ignored those and soldiered on without them. 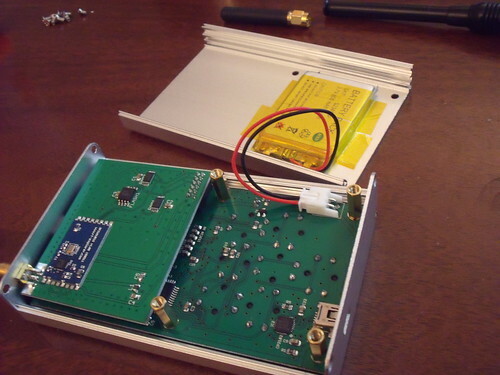 Card plugs into the daughter board connector and the antenna mount goes through the hole in the top of the case. 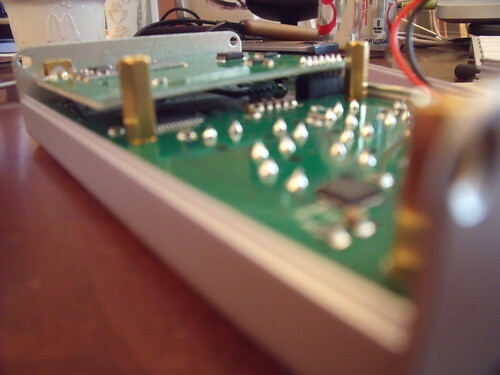 the bolt on the antenna mount is the only thing holding the board on except for friction from the connector which seems a bit flimsy, but frankly once the case is closed the card can't leave the connector anyway. Here's the whole works plugged in with a blurry close up of the connector that plugs in. the black part to the right is the plug. there is no other connection or mount between the boards. And here it is all put together and looking pretty. Magic Mouse provided for scale. And 'cause it's nifty. Here you can see the usb connector on the bottom that allows you to charge the unit and to hook it up to your PC or Mac. which brings me to my next post where i'll talk about my impression on operating this unit and give some screenshots of the Mac iRFExplorer Software. 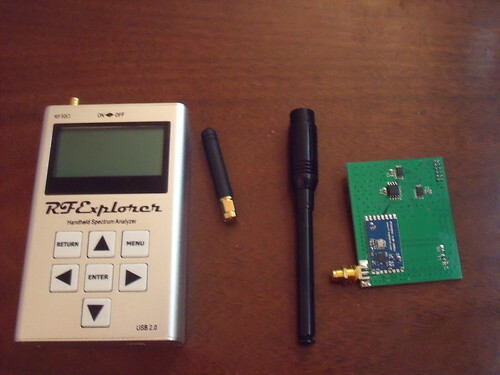 okay, more on the RF Explorer. Couple more pics since it took me a while to figure out how to post pictures here so i want to get some mileage out of the adventure. and this handy little screen was a thoughtful inclusion, since i forgot which antenna was which almost immediately after installing the daughter card. When i first took it out of the box, i installed the daughter card and immediately fired the unit up and started snooping around for RF. It was pretty intuitive right out of the box and even though i've not used a spectrum analyzer before i was able to find my way around on the unit very easily. I took it out on my stage and found all my IEM transmitter frequencies with ease. It was interesting to see how 'sloppy' some of my old Sennheiser G1 units are relative to my newer stuff as the Freq on their display was quite a bit more off from what the RF Explorer told me. Interesting. I suspected as much from experience but it was nice to see it right there on the screen. Once i finished playing around with it i immediately set about trying to get it to communicate with my Mac so i could get it on to a bigger screen. 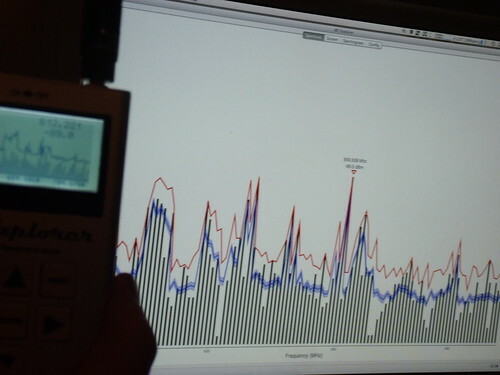 And that's where the RF Explorer shows it's 'hacker community' roots. If you're looking for 'plug and play' interfacing with a computer, you're not gonna get it here. And there was no 'step by step' instructions on how to get this done. Best part of all was when i figured out that i needed to update the firmware on my unit in order for the Mac software to work with it and the firmware updater only runs on a PC. ummmm... Thankfully my daughter still has the old windows XP laptop that i banished from my sight so i was able to borrow that and slog my way through. i did feel the need to take a shower when i was done though. 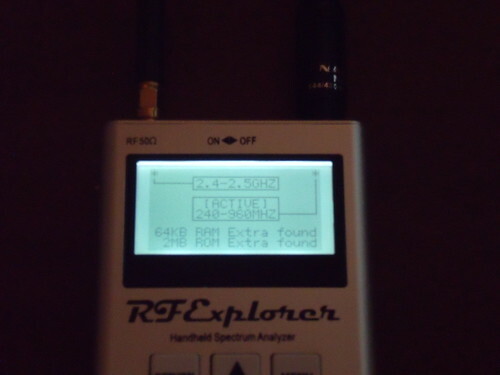 Anyway, it seems you need to have a USB driver to get the RF Explorer to talk to the PC. Then you need to run the updater. Then you need to find the USB driver for the Mac [a fact i did not see documented anywhere]. then you need to get the iRFExplorer software and run it on your Mac. All in all a bit of a pain, although i'm sure the original target audience would not find these things daunting or frustrating in any way. i'm just not that target audience. i also took a couple of screenshots. The software mostly offers an easier interface to get around on and a larger display, but you can do some time based spectrograms and such. 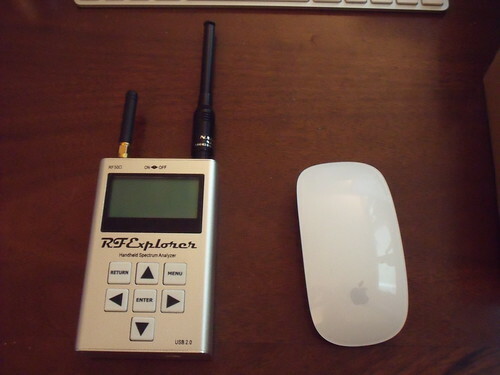 Also, the makers of the RF Explorer are also constantly adding features so there's no telling what is on the horizon and the ability to interface with a Mac is much appreciated. All of that hassle aside, i have to say that for a 'hobby' level unit the support is actually pretty good. Most of the resources i needed were available on the website [aside from the afore-mentioned Mac USB driver] and support in the community of users seems very good at this point. Add to that the recent acquisition of a US based distributor and things are looking good on that front. 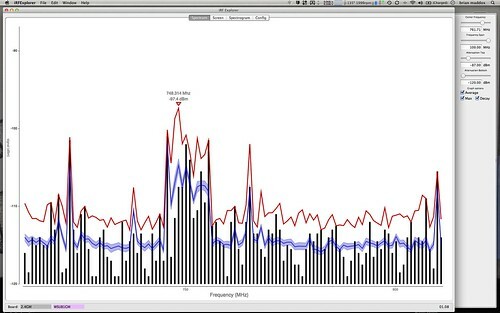 Pros: Does a very good job of showing in simple graphic form what is happening in the RF spectrum. The controls are totally intuitive and obvious, which is good since it ships with no documentation of any kind. It's reasonably sturdy, although if you're looking for Pro Level Bullet Proof, this ain't it. This is a hobby level piece of gear and it feels like it. That being said, it's got a nice sturdy metal case and good quality construction. The circuit boards are very well made and the components also don't feel 'cheap'. The rechargeable battery lasts a good while and recharging is very simple. And it is VERY cost effective. Cons: The buttons have a very 'clicky' feel which i don't particularly care for. I'd like to be able to control the on screen cursor a bit more to hone in on certain frequencies. It would be nice if the screen were bigger, but that's a trade off i can live with. And documentation is very scant and/or difficult to find. So, would i recommend it? In short, this box does exactly what it says it does. 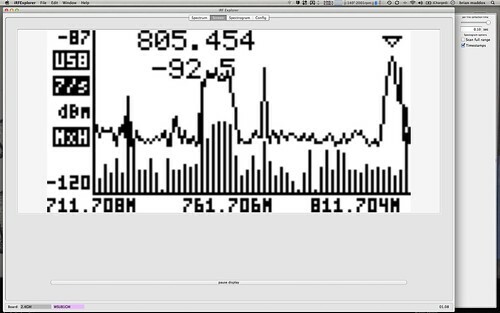 If you're looking for a full ride spectrum analyzer for a tiny fraction of the cost, you're not gonna be pleased. If you're looking for a very cost-effective tool for basic frequency coordination and troubleshooting, you're gonna be very happy. Since i am firmly in the latter camp, i am very happy with this box, and would feel comfortable recommending it to anyone in a similar situation.